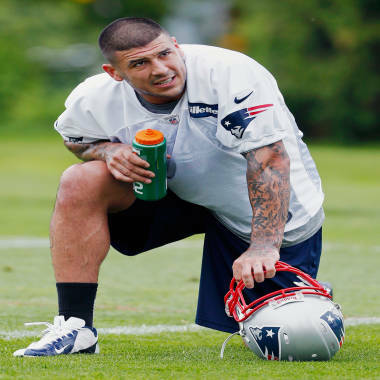 Police have paid multiple visits to New England Patriots player Aaron Hernandez's home over two days after the body of semi-professional football player Odin Lloyd was found less than a mile away. Sources have said the two were recently seen together. NBC's Stephanie Gosk reports. A body found about one mile from the home of New England Patriots tight end Aaron Hernandez has been ruled a homicide, prosecutors said. The body of 27-year-old Odin Lloyd was found about one mile from the home of the New England Patriots tight end in an undeveloped area, Bristol District Attorney Samuel Sutter’s office said. Two members of the Massachusetts State Police walk toward the front door of the home of New England Patriot's NFL football player Aaron Hernandez in North Attleborough, Mass., Wednesday, June 19, 2013. Hernandez, who signed a five-year contract with the Patriots a year ago, has not been named as a suspect in the case. More than a dozen State Police investigators were at Hernandez’s North Attleborough home Wednesday, NBC News affiliate WHDH reported. Lloyd was described as a semi-professional football player with an unspecified connection to Hernandez, friends and family told WHDH. An uncle told the AP that Lloyd had a connection to Hernandez, but did not offer any other details. Ward would not comment to the news service on whether the football player and her son had any relationship. New England Patriots' Aaron Hernandez kneels on the field during NFL football practice in Foxborough, Mass., Wednesday, May 29, 2013. The Patriots said they do not plan on commenting while an investigation is ongoing. “I am aware of the reports, but I do not anticipate that we will be commenting publicly during an ongoing police investigation,” Patriots spokesman Stacey James said, according to the AP.